Julian Stockwin (born 1944 in Basingstoke, Hampshire, England) is an author of historical action-adventure fiction. As well as the Kydd Series he has written two standalone novels The Silk Tree and The Powder of Death. Born in 1944, Stockwin soon developed a love for the sea, having an uncle, Tom Clay, who was a seaman in square-rigged ships and had sailed around Cape Horn in the Cutty Sark. After grammar school, his father sent him to sea-training school at Indefatigable at age 14. He joined the Royal Navy at 15 and transferred to the Royal Australian Navy when his family emigrated. Stockwin served eight years, and was eventually rated petty officer. Stockwin attended the University of Tasmania to read Far Eastern studies and psychology. He did post-graduate work in cross-cultural psychology. 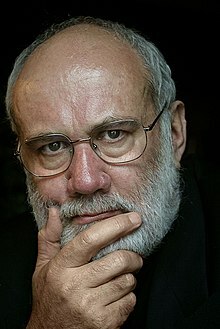 He got involved in the manufacture and design of computers and software development. Returning to the navy and the Royal Navy Reserve, Stockwin was honoured with an MBE and retired as lieutenant commander. He returned to the United Kingdom in 1990 and started to write in 1996. He currently resides in Ivybridge, Devon. A wig maker from Guildford, Thomas Kydd finds himself pressed into service of the Crown as a landsman. His first berth is aboard HMS Duke William. Now berthed in Artemis, Kydd journeys to the Pacific and China. Kydd and Renzi are shipped to the Caribbean. There they take aboard the Seaflower cutter. Mutiny off the Nore finds Kydd with split loyalties; between his duty and his shipmates. After being promoted to Lieutenant after the Nore Mutiny, Thomas Kydd joins Tenacious serving in Canada. Kydd's ship the Tenacious contributes to the Battle of the Nile. Kydd is assigned to Commander of Teazer patrolling the waters around Malta and the Mediterranean. War with France resumes. Again in command of Teazer Kydd has challenges naval and relational as he encounters an Admiral's daughter, the sophisticated Persephone Lockwood. Kydd is disgraced and leaves naval service. However he takes to the sea again as a privateer. Exonerated and back in Naval service Kydd encounters the rocket inventor Robert Fulton. Our hero takes part in the build up to and the Battle of Trafalgar off the coast of Spain. Cape Town a Dutch town is to be taken; so Kydd joins an expedition of joint land and sea-based forces. Travelling from South Africa to Buenos Aires to take part in Commodore Popham's audacious attack. The sugar trade important to British interests is threatened. So Kydd must respond. Istanbul and the Dardanelles are the setting for conflict and intrigues; where Kydd’s 'particular friend' Nicholas Renzi is right at the heart of things. Kydd gains command of HMS Tyger at a critical moment in his career. The Danish fleet is the focus of British and French attention and diplomacy is urgent with Napoleon's forces rapidly approaching Copenhagen. Kydd now a celebrated hero takes HMS Tyger to Lisbon and meets Persephone Lockwood, his old flame. At short notice Tyger is called to join a newly assembled fleet and sent to the Baltic and the only remaining continental ally to Great Britain the kingdom of Sweden. Kydd find he is to serve under Sir James Saumarez a Vice-Admiral that he has encountered before. The Iberian peninsula is in ferment and Bonaparte seeks to carve up Portugal and install Joseph, his brother as King of Spain. Renzi is sent to incite opposition to France's intentions in Spain. Kydd becomes embroiled in support of the British expeditionary force in North Western Spain. Back in London after Corunna, Kydd is again the hero. Soon the 'Basque Roads' is the scene of his next encounter with the French, thrust in the forefront of the action at the insistence of Lord Thomas Cochrane. In addition financial ruin beckons. The Silk Tree (2014) A fictional account of the bringing silkworm eggs to the Byzantine Empire from China. The Powder of Death (2016) A fictional account of how gunpowder came to England and its use in cannons. ^ a b Stockwin, Julian. "Stockwin's official biography". julianstockwin.com. Archived from the original on December 31, 2012. Retrieved 2007-07-06. ^ Blake (agent), Carole. "Agent's page". blakefriedmann. Archived from the original on 2007-09-29. Retrieved 2007-07-06. ^ "Julian Stockwin". Historic Naval Fiction. Retrieved 27 Mar 2018. This page was last edited on 7 January 2019, at 09:53 (UTC).